A-la-cuisine.blogspot.com - A Lá Cuisine! Topics: Grilled Fish Fillets, Tondli Bhaji, and Soya Curry. 9 users visit the site each day, each viewing 1 page. 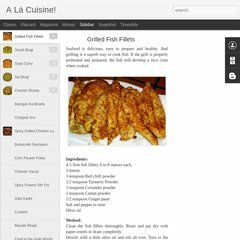 A-la-cuisine.blogspot.com's server IP number is 72.14.204.132. It is hosted by Google Inc. California, using GSE web server. A time of 21.9 ms, is recorded in a ping test.